A report on the state of the flash memory and disk storage industries has predicted that using SSDs will become more economical than HDDs for most purposes from 2016 onwards. The prediction applies to "almost all storage" but it seems like the largest capacities will remain the forte of spinning disks for a bit longer. Wikibon followed up its 2009 report with another, recently, focussing on the 'Evolution of All Flash Array Architectures'. It concluded, in summary, that over the next two years it will be more cost effective to invest in SSDs for most storage requirement cases. 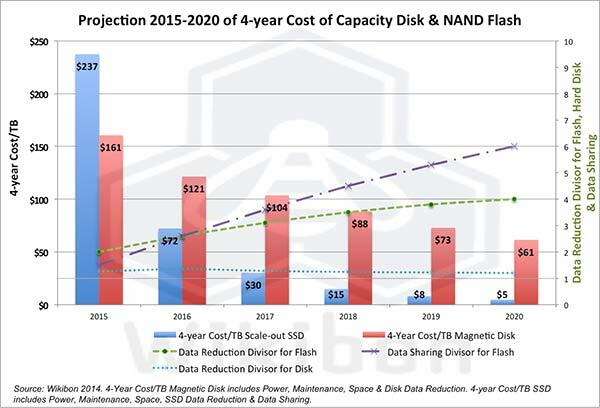 Of course one of the main factors driving this storage revolution is the ever decreasing cost of flash memory and thus SSDs. 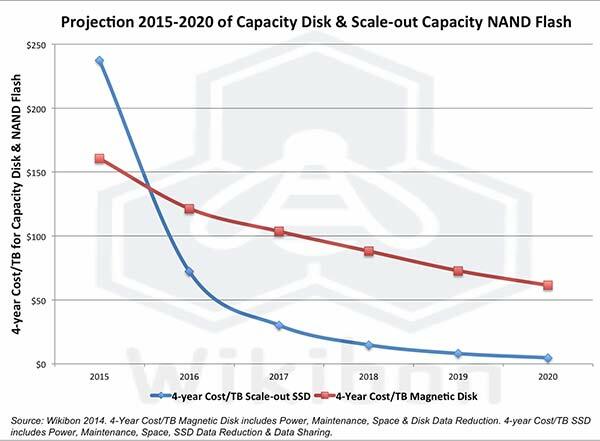 While HDD costs are falling and capacities increasing they are being outpaced by what flash can offer. For an analysis to appeal to business and enterprise Wikibon's costs comparison takes into account power and maintenance costs over a four year period. Wikibon says that flash prices are down and will continue to fall sharply due to consumer demand. Furthermore its use in data centres and enterprise will increase with new architectures and philosophies. It sees the end goal of the electronic data centres as removing all mechanical components except for a few cooling pumps and fans. Why aim to completely eliminate mechanical storage? A fully flash based data centre will enhance application design which has been hobbled by mechanical storage, says the research firm. "Most of the problems in operating current applications are storage related, and almost all the constraints in application design are storage related," asserts Wikibon. Moving to flash will help fix this problematic impact on businesses and we could see new kinds of applications emerge. Probably at the low end (i.e.for what most average-Joe laptops need). High end, spinny disks will be round for a few years I reckon. I would have thought the other way round. Probably the biggest saving would be in duplicate servers, as the higher speed of flash storage would allow the same drive to service many more concurrent users, but this doesn't really affect low-end purchasing decisions. Cooling, power, building and maintenance costs are included in the costs to a datacentre, and they affect them far more than my PC (or to be honest, I ignore them and just think about purchase cost - but I bet I am not alone). Yes, when maintenance costs are factored in, then the cheaper, but more prone to failure system will have its TCO raise a lot more. Every HDD failure in a datacentre or office is employee time taken to fix/wait for the fix. This isn't relevant for cheap consumer equipment, where the lowest price will still win. Even so, small-capacity flash storage is winning in some devices - Chromebooks for example. The cloud storage they use is probably still HDD based though. A fully flash based data centre will enhance application design which has been hobbled by mechanical storage, says the research firm. “Most of the problems in operating current applications are storage related, and almost all the constraints in application design are storage related,” asserts Wikibon. Moving to flash will help fix this problematic impact on businesses and we could see new kinds of applications emerge. Colour me doubtful about these statements on a couple of levels. For a start a data centre app backend is usually (there are exceptions) backended by some substantial slab of SAN-based storage - and all the SAN devices I've come across cache pretty aggressively and RAID like crazy, so I'm dubious that moving from HDD to SSD will necessarily be a big deal. I also remember a storage guy telling me that his fancy box was pretty clever at optimising requests to make sure that best use was made of head movements etc. But if your app is based on many small (blade?) servers then sure, going SSD makes a lot of sense. And while I agree that there's scope for “better” apps if we can increase the performance of the storage component, the apps I've come across invariably need more storage (usual) and/or faster data commits. SSD's have smoking read access, but aren't write accesses comparatively slow? Now for consumer SSD's I see a rosy future - personally when the price of a 1TB+ SSD falls below £150 (list) then I see all desktops and laptops shipping with SSDs rather than HDD's. Two of the four laptops in this house are SSD-booting, with one of the two desktops. Drop the price of 1TB+ SSDs and I'm absolutely convinced that we'll go 100% SSD. crossy, what's the boot time for your ssd laptops from power on to windows desktop fully loaded?